The remains of a Vietnam War-era pilot whose F-4 fighter crashed into the North Vietnamese jungle 28 years ago have been found, identified and returned to the United States, according to his widow. Air Force Colonel Ivan D. Appleby and his navigator, William Austin, were on a combat mission October 7, 1967, when a surface-to-air missile blasted their fighter plane. Austin was able to eject safely and was captured. 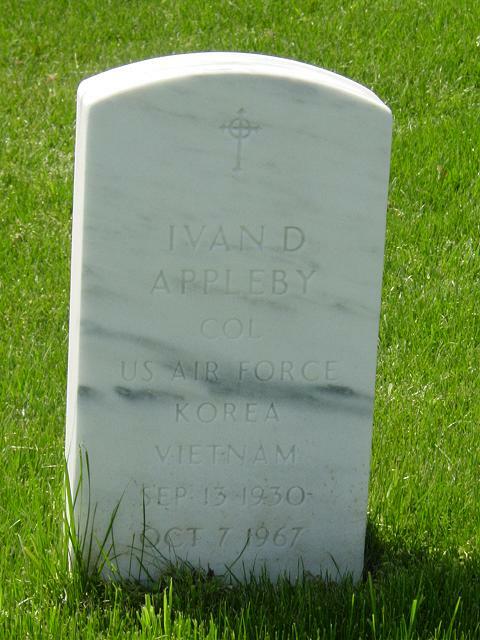 Appleby's remains were returned to the United States at the end of last month. "There's going to be a ceremony December 8, 1995 at Arlington National Cemetery, and my children and I will be going there for that," Shirley Appleby said Thursday. The Applebys' children - Bonnie, Jay and Andrea - were 11, 10 and 8, respectively, when the family was told that their father's plane had been shot down.